Students from Oak Park River Forest High School, Trinity High School, Interlochen Arts Academy (MI), Brooks Middle School, Sandburg Middle School (Elmhurst), and Willard School will win top prizes in the One Earth Our Earth Young Filmmakers Contest during the One Earth Film Festival, March 4-6. From the glamorous stars on the Red Carpet to the award's presentation extravaganza itself, the Oscars were Hollywood’s night to shine. But there was one documentary that we were proud to see among the nominations, "Racing Extinction." This groundbreaking documentary examines biodiversity loss, its effect on humanity, and the solutions that inspire hope for a more sustainable future. Joined by new innovators, this documentary brings a voice to the thousands of species teetering on the very edge of life. Chicago is well known for its commitment to developing protected bike lanes within city limits. Currently, it has over 200 miles of on-street buffered and protected shared bike lanes. Are you one of the bikers who rides on the city's protected lanes? Would you like to be? Join One Earth Film Festival as we celebrate biking and alternative transportation, Sun. 3/6 @ 3:30pm for a view & brew screening event of "Bikes vs. Cars." at Frontier Chicago, 1072 N. Milwaukee Ave.
Ramona Baptiste grew up detesting the foods that her dad frowned on as child himself: beans, oatmeal and okra. Part of large Southern family, her dad ate those staples too much for his liking. Ramona, who grew up in Chicago, had an altogether different kind of childhood diet. Her mom cooked a lot of steak, she recalls. Fifth Annual Green Carpet Gala! Imagine savoring Indian fritters and chatting with friends, activists, and artists, while looking through large glass windows at the shimmering lights of Michigan Avenue. We invite you to celebrate in this style with us at the Green Carpet Gala, the opening event for the One Earth Film Festival, 6:30 p.m. Friday, March 4, at Fourth Presbyterian Church’s Gratz Center, 126 E. Chestnut St., in downtown Chicago. We will join with creative leaders from the sustainability and filmmaking communities to mingle, look back at past accomplishments and ahead, at what the One Earth Film Festival weekend will hold. This Fifth Annual Gala will be green in every way. Our caterer, Michaels, is considered the “greenest caterer in American” due to two green restaurant certifications. Returning for the second year by popular demand, they will offer vegetarian and vegan-friendly finger food options such as Portobello mushroom wraps and homemade sweet potato chips with pineapple salsa. A variety of beverages will be available, with beer provided by Goose Island Brewery, an official sponsor. As we look back at our past and ahead with hope, our venue echoes this theme. 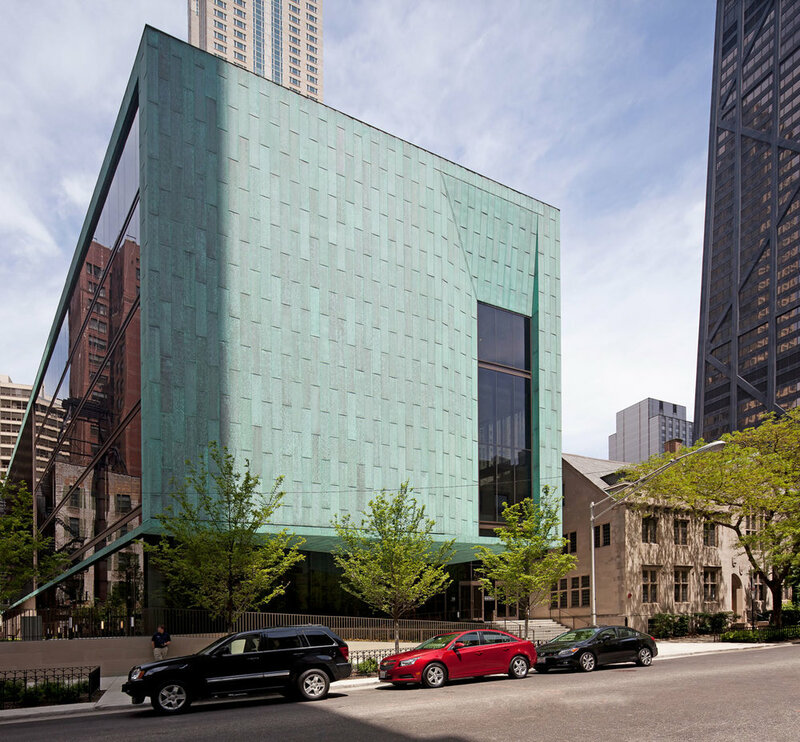 The Gratz Center addition, built in 2013, is a contemporary counterpoint to Fourth Presbyterian’s Gothic Revival structure, built in 1914. 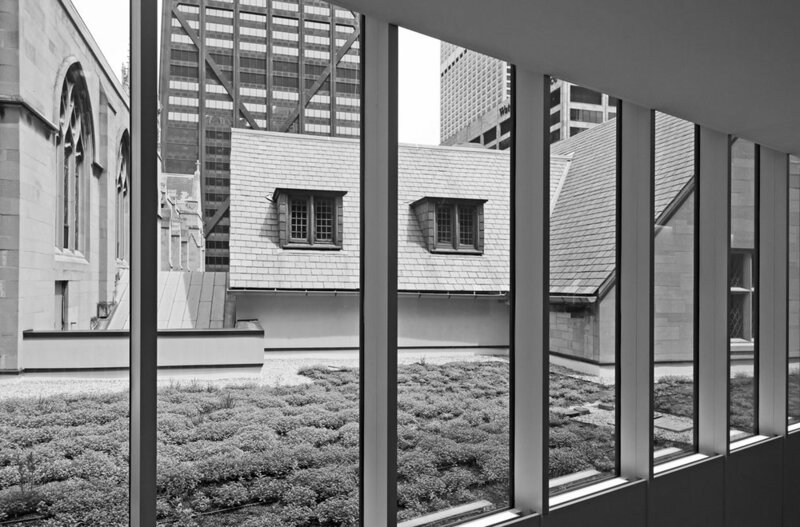 The large windows described earlier not only show the twinkling lights of Michigan Avenue, but also one of the building’s three green roofs in this LEED-certified addition. After having ample time to talk with friends, old and new, we will head into Buchanan Chapel for the evening program. Seva Gandhi, senior program coordinator for the Institute of Cultural Affairs, will lead events, which will be interspersed with several short films. But wait. Mustn’t forget about our waste, which will be minimal. Chamness Biodegradables and Green Home Experts will help us make this a zero waste event, making it truly green from start to finish. Important details: Attire is business casual with a celebratory flair. Validated parking passes ($8) will be available at our event reception desk for those who park in the 900 N. Michigan Avenue Garage. Enter the garage one block west of 115 E. Delaware Place, on the north side of the street. Arrive early, at 5:30 p.m., to test drive the Nissan LEAF electric car!